Not many people know that I really like manga and anime. If you aren't familiar with manga or anime, it's a Japanese comic almost but it's really cool. Here are some of my recent favourites which I wanted to tell you guys about. This is probably my all time fave. It's amazing. A combination of a great story line and character driven too. It's about wizards but not the Hogwarts type, no, very different. 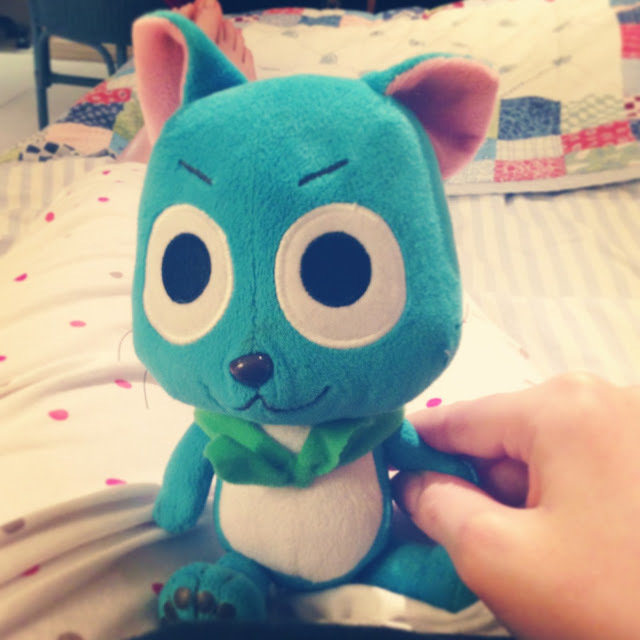 My favourite character is Happy, a little magical talking blue cat who can fly. I have a happy plushie too :D the joys. I finished watching this a few months ago and it is a lot darker than fairy tail but still has the core character relationships of it. Would definitely recommend if you like darker sci-fi types. Summer Wars is an anime movie I just watched and I really liked it. It wasn't too predictable. It had a similar story line to digimon but a more sophisticated approach. Those are all I'm going to talk about today. I'm craving a cup of tea and a movie.